It’s Day Nine of 12 Days of Christmas Kindness, giving simple and doable ideas for reaching out to others during the Christmas season. If you’re just joining us, catch up on each day here. 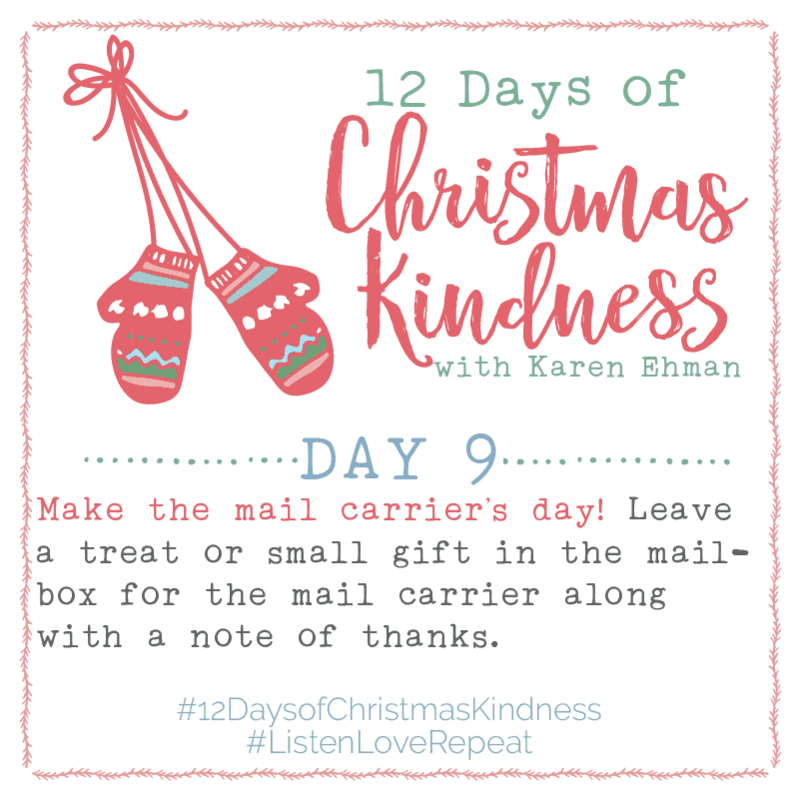 For Day Nine, let’s make the mail carrier’s day! Leave a treat or small gift in the mailbox for the mail carrier along with a note of thanks. 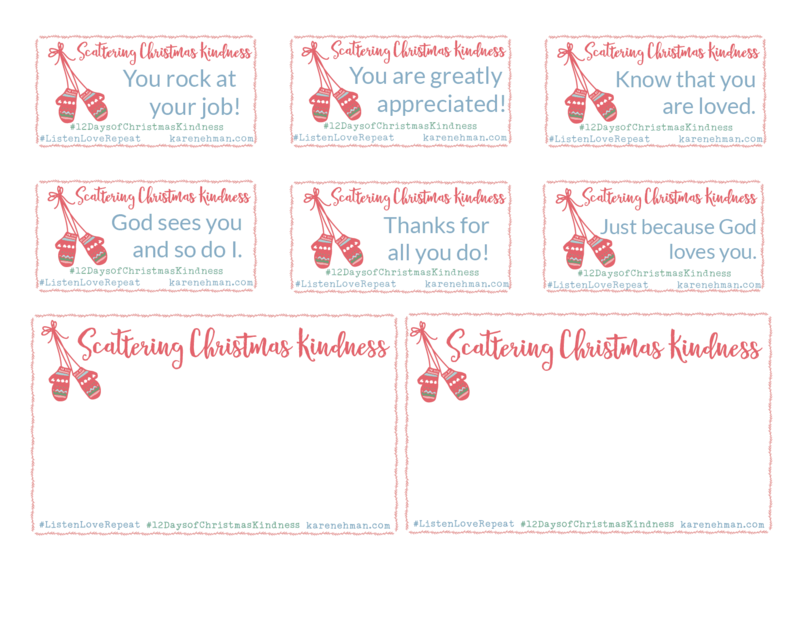 These Scatter Christmas Kindness cards make it easy! Today I’m joined by my friend and fellow Proverbs 31 Ministries writers team member, Katy McCown. Katy is mom of six and the wife of Luke, an NFL quarterback with the New Orleans Saints. (If you don’t recognize his name, maybe you remember him from this Verizon commercial!) 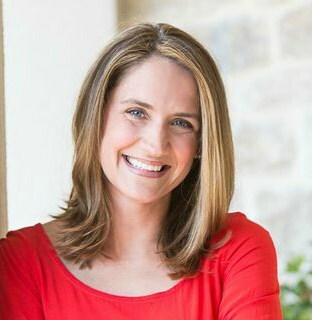 Katy is also a speaker, writer, and founder of the She Laughs conference. She Laughs provides a place for women to rest and recharge while we equip you to navigate life’s disappointments, manage your demands and connect to God’s call for your life. You can connect with Katy on Facebook and Instagram. 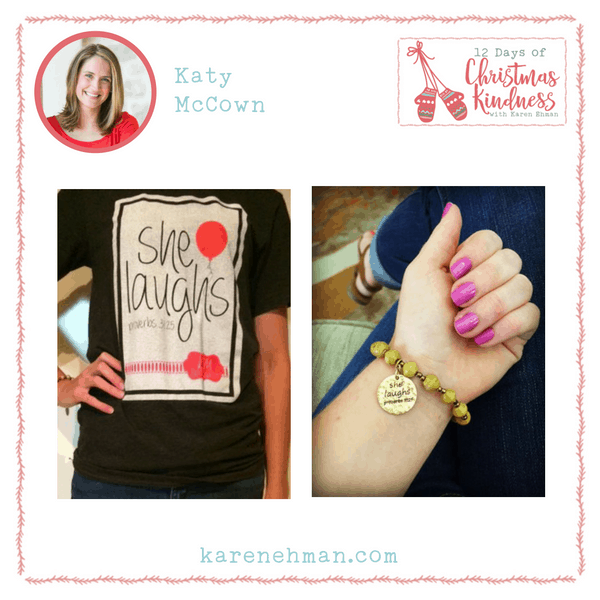 Katie’s Day Four Giveaway is a She Laughs bundle which includes one She Laughs t-shirt and one She Laughs bracelet. She’s also offering 20% off to my readers today through Saturday, December 17 in her shop. (Can’t guarantee Christmas delivery, but she’ll try!). Use coupon code 12DAYSOFCHRISTMAS at checkout. Are you ready for Day (day)? Let’s go! Go scatter kindness by making the mail carrier’s day. Post on social media using the hashtags #12DaysOfChristmasKindness and #ListenLoveRepeat. You can just post a simple thought. Or, you can save and then share today’s Christmas kindness idea. Or, even better, post a picture of you doing the idea given for scattering kindness. Just be sure to use the hashtags #12DaysOfChristmasKindness and #ListenLoveRepeat. 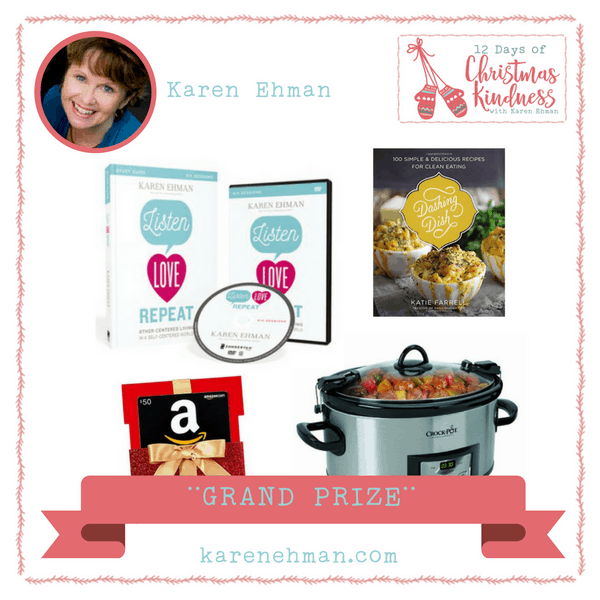 And, if you could link to this post when you share, that would be FAB!